A Technical White Paper – Powering Integration Success with an Interface Engine. Today, many Health Care Organizations, including laboratories are faced with the daunting task of creating and managing HL7 interfaces. Many of these organizations are turning to interface engines. 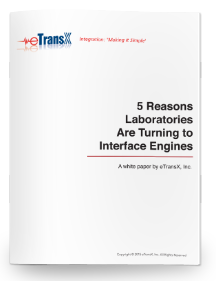 This white paper explores the 5 catalysts for the migration from point-to-point interfaces to interface engines. To request a copy of this white paper, simply complete the form to the right. Please fill out this form below to download your free copy of the white paper.